We are well into Fall season now, and this is my favorite time of year! We have been enjoying the flavors of pumpkin, apples and other fall favorites! I've also gotten into experimenting with some new fall recipes and have pressed my family into food tester service, lol. These lunches are quite similar, but they were made with different sides and were enjoyed on different days. The English Muffins are Thomas' limited edition pumpkin spice. All of us like these very much. We found some pumpkin pancake and waffle mix during a recent visit to Trader Joe's and my wonderful hubby made some pancakes with it for breakfast the other day. I used the same mix and made some of our favorite pancake muffins! These were simple and are very tasty without any toppings. I usually add frozen organic blueberries, strawberries and chocolate chips. You can also use bacon, ham and sausage pieces if you prefer adding meat. I love the idea of baking several batches at a time and freezing the extras for those super busy mornings when we need to grab and go. These particular ones were baked the day before and I'd left some out for the next morning, the rest went into the freezer. They are very simple to make, and you get the ease of a muffin with the deliciousness of a pancake. Pam non-stick cooking spray or muffin cups. In medium bowl, stir together pancake mix until moistened. Do not over-mix. Spoon batter into greased or paper lined muffin pan, filling ¾ full. There is enough batter to fill one dozen muffin wells. Bake at 350º for 13-15 minutes or until a toothpick inserted into center comes out clean. 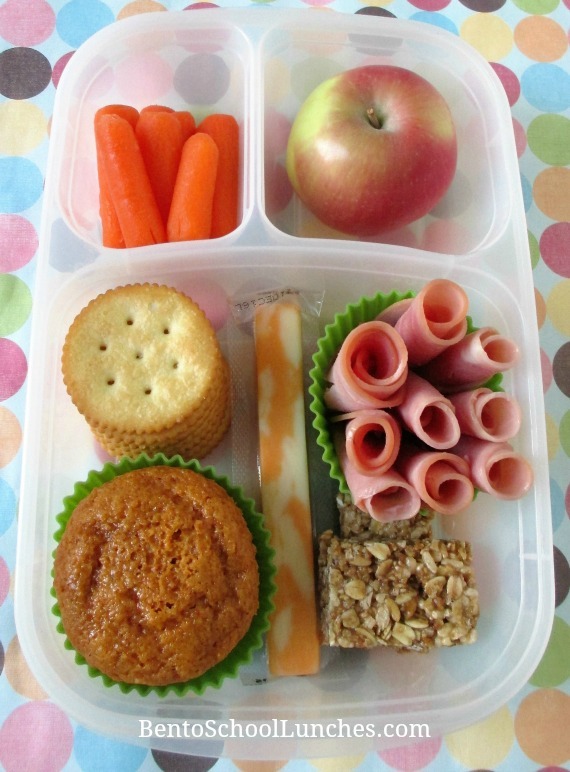 In this bento lunch: A pumpkin pancake muffin, string cheese, granola bar, crackers, nitrate free ham roll-ups in my favorite silicone cup, organic baby carrots and an organic apple. The photos below show some Thomas' limited edition pumpkin spice English muffins. 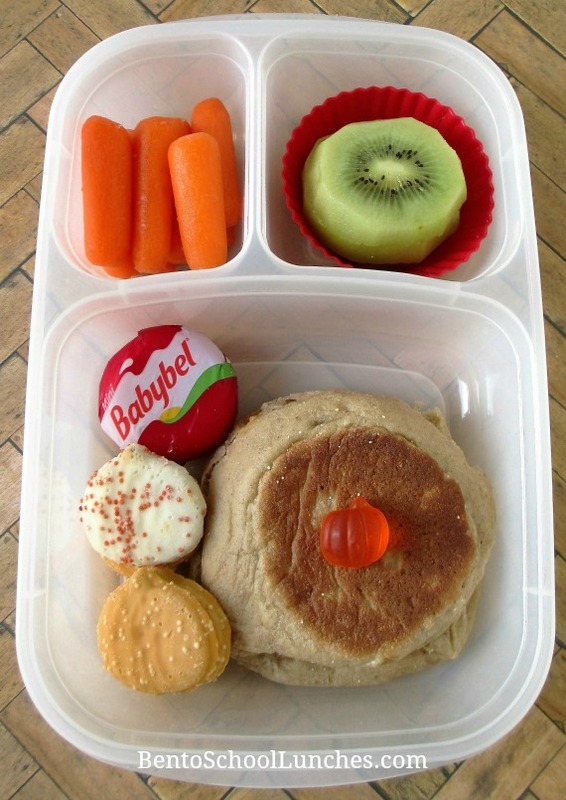 In this bento lunch: English muffin topped with a pumpkin shaped gummy candy, yogurt covered pumpkin shaped cookies from Trader Joe's, Babybel cheese, organic kiwi slices and baby carrots. 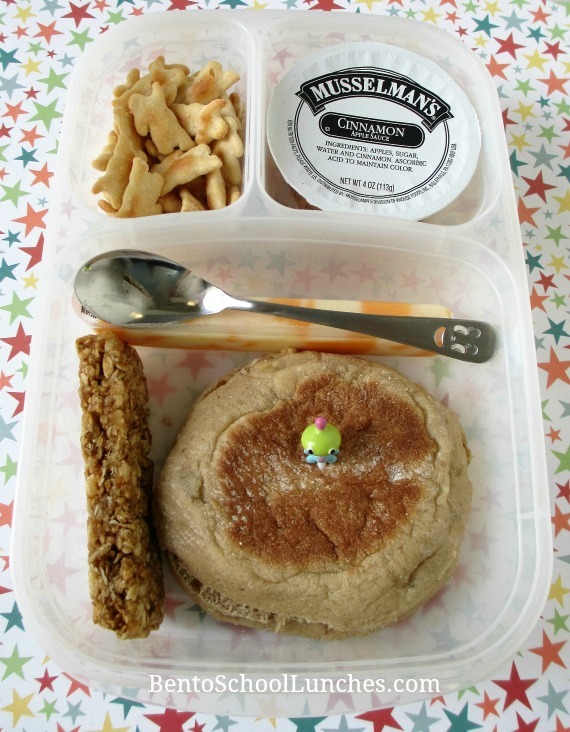 This is the easiest bento lunch of all: English muffin with a cute alien pick, granola bar, string cheese applesauce, a smiley face spoon and Annie's organic crackers. This is typical of the type of lunch that I pack whenever I'm low on groceries. 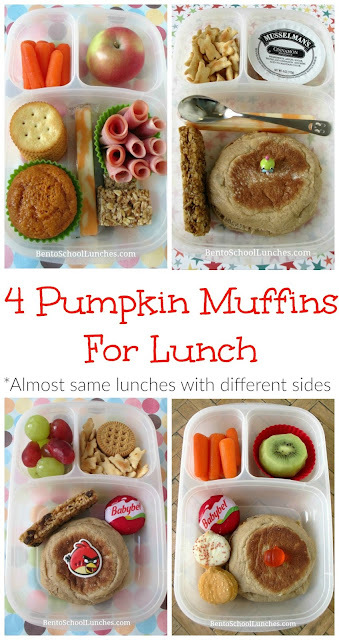 These fours lunches are almost similar, but with different sides. Most importantly, Nikolai loved his lunches. Yay to mom! All of these lunches were packed in our Easylunchboxes. 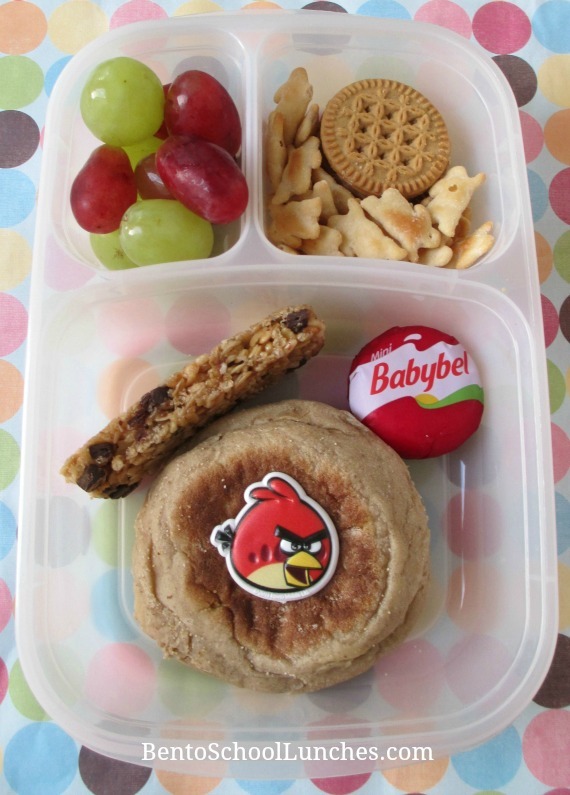 Love these lunches, looks yummy! Thanks for sharing the recipe!